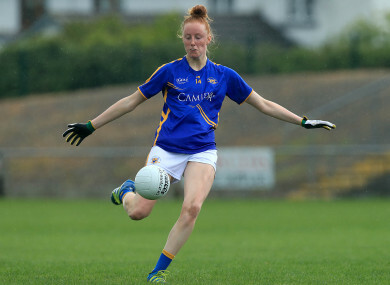 Aishling Moloney starred for Tipperary as the Premier County picked up a valuable victory over Cork. A MAGICAL 2-9 haul from Aishling Moloney saw Tipperary claim a surprise victory over Cork in their Lidl National Football League Division encounter at Páirc Uí Rinn on Saturday. On an historic day, which saw the Cork ladies play their first double-header with the Cork men’s football side, the Rebels were favourites to win, but Tipperary staged a superb second-half comeback to claim the three points. Moloney’s two goals set Tipperary up for the victory, but the vital score came from 16-year-old debutant Caitlin Kennedy, who crowned her first game with the winning goal in the 59th minute. It had all started so positively for Cork, who took the lead in the second minute when Orla Finn pointed from a free, although Moloney replied from the restart. Less than three minutes had elapsed when Cork fired the first goal of the game. Sadhbh O’Leary was the creator and she played in Niamh Cotter, whose low shot found the net for the home side. A Finn free added to Cork’s lead, although Anna Rose Kennedy responded with Tipp’s second point. Áine Terry O’Sullivan and Moloney exchanged points before Cork started to dominate. In the space of four minutes they scored four points, three frees from Finn, along with one from Laura O’Mahony, making it 1-7 to 0-3 in Cork’s favour. Moloney pointed from a free, while Finn and O’Sullivan kept the scoreboard ticking over for Cork, who were good value for a 1-11 to 0-8 half-time lead. But from their Tipperary took charge. Finn opened the scoring in the second-half, but Moloney and Kennedy pointed, before Moloney struck their first goal after 38 minutes to lift Tipp’s hopes. With Finn and O’Sullivan on song Cork pushed their way into a five-point lead, but with 10 minutes to go Moloney struck Tipp’s second goal to trim the lead to two. Farmer and Moloney exchanged scores, but the game turned in the last minute. Crucially, a long delivery from Moloney was caught by Caitlin Kennedy, and she found the back of the net to secure Tipp’s first win of the season. Scorers for Tipperary: A Moloney 2-9 (8f), C Kennedy 1-1, R Howard 0-2, A R Kennedy 0-1. Scorers for Cork: O Finn 0-9 (6f), N Cotter 1-1, A T O’Sullivan 0-3, S O’Leary 0-2, O Farmer 0-2, L O’Mahony, 0-1. Email “Aishling Moloney stars as Tipperary stun Cork at Páirc Uí Rinn”. Feedback on “Aishling Moloney stars as Tipperary stun Cork at Páirc Uí Rinn”.